Fellow role-players, here is my update for Session T3.39 of the latest adventuring party in my “Vanished Lands” heroic fantasy campaign setting. The teleconferencing team met on Sunday, 15 January 2012, using Pathfinder, Skype, and an online dice roller. In one ancient world, there was a region where strange majicks and demihuman races thrived. After “Holy Steel‘s” journey to the distant empire of Khemet, another motley group gathered in the northwestern “Vanished Lands” to explore a world full of perils and wonders…. After meeting in the Wisalef Forest, an unlikely band of adventurers encountered the hostile Centaur followers of Vappu Lahja and Unseelie Fey in the increasingly dangerous borderlands…. >>”14 August 1229 B.C.E. :” After reporting to the Grove of Mekkil and the local Rangers’ Guild, the trio of travelers rested at the “Unicorn Moon” inn. The next morning, Asish, Jovinda, and Kazuo continue their exploration of the Elven city of Alfendi. At the main market square, Asish buys fruit and wine and inquires about leatherworkers for skins he recently took from a fallen Ettin. The Ranger learns of tanners on River Street near the North Square and asks them to rework the hides into barding for horses Onimusha and Gashmu. Jovinda asks Kazuo if he’d like to visit the arenas or temples to look for other Monks, but he declines. The Cleric also makes plans to summon a hawk companion and to help Asish with a ritual for his dog Genghis, probably outside the high city walls. Meanwhile, after a journey of several months from the Halmed Desert far to the southwest (see the “Broken Chains“), Hatem Shisakli arrives in Alfendi, seeking enlightenment. The Dervish finds his way to the bright cathedral of Corellan Larethian, where he obtains an audience with high priest Felhis Kallen. Tsucharim archer Asish asks various merchants about a bowyer/fletcher and is eventually referred to a Sylvan (Wood) Elf named Hasariel who has a shop near the North Park. He reunites with Jovinda and Kazuo at the temple of Corellan, where they wait in line with an impatient Elven knight to speak with Felhis. The Quelanthi (High Elf/Eladrin) high priest is speaking with a dark-skinned, robed human. Sir Japeth talks with the Clerics of Corellan, head of the Sylvan pantheon, leaving the other visitors to wait a bit longer. Jovinda introduces herself as a priestess of Mekkil, goddess of nature, to Hatem, but Nezumi Kazuo is quiet, and Asish recalls Kovar’s usual wariness. Felhis Kallen returns and apologizes, saying that he had urgent business with the Paladins. Jovinda repeats her warning about the spread of Vappu Lahja’s intolerant teachings and corruption of the Fey folk between the Plains of Sathendo and the Wisalef Forest. She also asks for access to the temple library. The high priest offers to help with holy water and healing, and he asks Hatem if he might find knowledge by traveling with the group. After some consideration, Hatem agrees to go with Jovinda, Asish, and Kazuo. 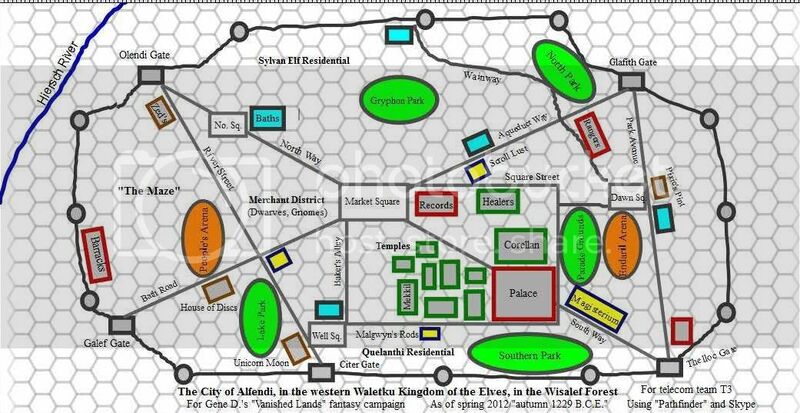 Sir Japeth pledges to continue smiting evil, and Jovinda gives Felhis and scribe Lejorian an old map of Ley lines and border settlements to copy. The grateful group leaves the temple district and goes to Alfendi’s Hall of Records to search the civic library for more information that might help them against Vappu Lahja. At the front steps, an attractive Saganim/Shengtese human woman recognizes them. Smitten Asish stammers a greeting to “Jade Xi Aschent” [Sammy/Non-Player Character], but Jovinda and Kazuo are not impressed by Digger’s onetime rival. Hatem is bemused. The tomb raider exchanges strained pleasantries and makes a dinner date with Asish back at the “Unicorn Moon,” where she also happens to be staying. In the Hall of Records, Quelanthi librarian Celondoril helps the outlanders conduct their research. Asish looks for more maps and records of past wars. Hatem shows his new companions where he is from. “Hijiri” Jovinda asks about Druid meeting places, and she and Kazuo study dusty tomes for variants of the legend of Vappu Lahja. The group also learns that hundreds of years ago, the junctions of the Saganim empire, the Waletku kingdom of the Elves, and the Zeda kingdom of Dwarves and Gnomes — not to mention the Orcs of Zuromm — were very different from the present boundaries. Dwarven outcasts Konar, Rollin, Nesil, and Gofdur helped early Hifalendorin (proto-Western European) humans, and their sons may still be alive. After a few hours, the wanderers leave Celondoril to his stacks because they have meetings planned with Ranger Aldarion, Jade, and others in Alfendi…. Welcome again, Josh! I look forward to continuing this telecom team’s adventures on Jan. 29. See also my separate posts regarding multiclassing and prestige classing. Posted on January 22, 2012 by GeneD5Posted in Fantasy & Steampunk, Games, Vanished LandsTagged Holy Steel, pathfinder, rpg, telecom team.